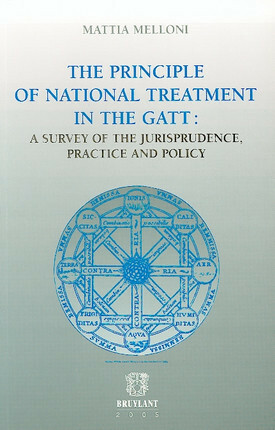 The analysis of the principle of national treatment in the GATT has shown many weaknesses or flaws over the years. The language used by GATT/WTO panels and the Appellate Body in interpreting the two prongs of it, namely, likeness and protection, lags behind economic reality. This study reveals those flaws or weaknesses and offers a clearer and sounder legal analysis based on economic criteria. Marrying law with economics seems to me to better help the WTO promulgate transparency amongst its Members while offering them legal certainty. Analogies with the law and the reasoning of the investigating authorities in the United States and the European Communities are drawn to support the legal arguments. Mattia Melloni is a lawyer in Brussels where his main practice revolves around international trade law and EC law. He started his professional career in London while working for a leading international law firm in competition and trade matters. Mr. Melloni lectured at Bocconi University in Milan as well. He was junior visiting professor in 2004 where he taught International and European Law. Prior to his re-entry into private practice Mr. Melloni was a Marie Curie Fellow at the Amsterdam Center of International Law of the University of Amsterdam, and a teaching assistant in International Law at the John Hopkins University, School of Advanced International Studies, Bologna Center.